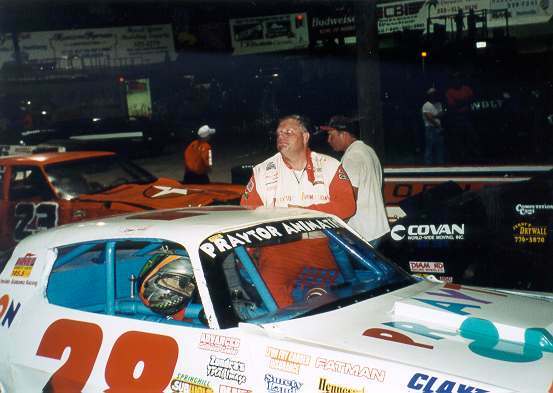 Snowball Derby 2000-The last race in Mobile was costly, the guys worked overtime taking out everything from the back of the block through the rear end out of the car repaired or replaced it put it back and changed the setup for Pensacola. Needless to say we were guessing as to what we had and I guessed wrong for qualifying and it cost us. 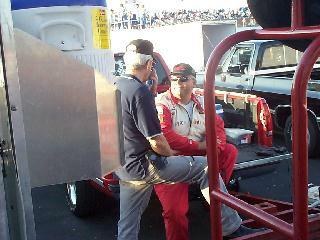 We qualified 32nd out of 64 which was not enough to get us in the race so we had to go the qualifying race. 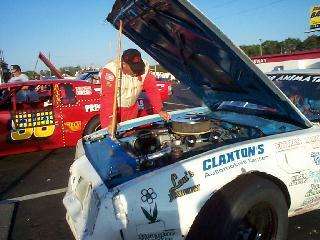 We had a good start and led briefly until we got together with another car and ripped the left side off the car. 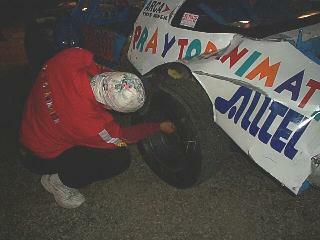 The guys changed a tire pulled away some sheet metal and kept us on the lead lap. 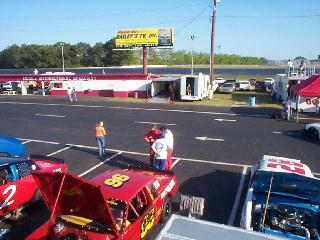 We worked our way back in to the top 10 and got collected in another wreck. We finished the race but we limped home with what was very good car. After such a bad start I thought the weekend would be shot but it ended up being a fun weekend with a lot of great racing. Kevin Brill and the guys from Pensacola ALLTEL were great host at the hospitality tent. This years Snowball was the first not to have Red Farmer in it. 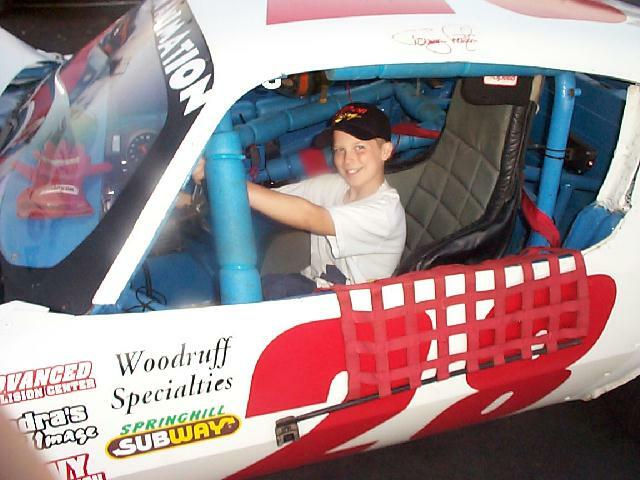 Don't worry Reds not through driving he'll be at the wheel of his dirt late model. A tough night was made better by some friends showing up. 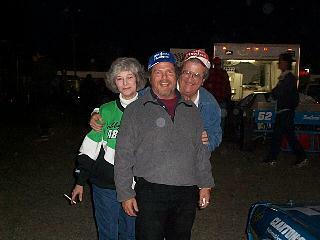 Phil Huber is in the front and thats Buddy & Susan Peobles celebrating their wedding anniversary at the track with us. 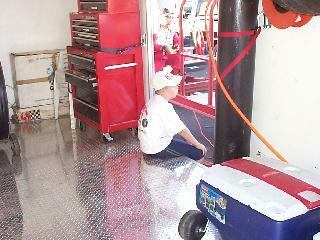 Ward working on the car earlier in the day-while it was still together. OK enough of the carnage I put us in. 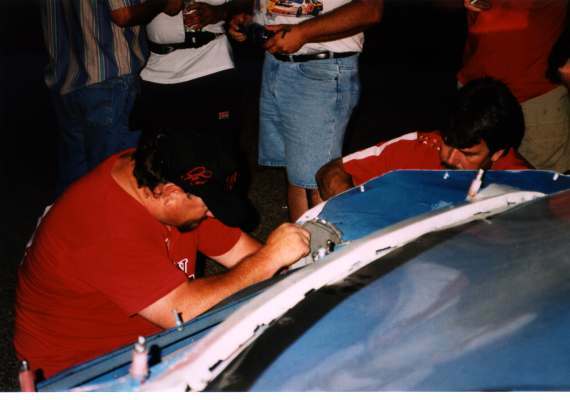 11-25-00 Mobile World 200-During the 2 weeks off the guys worked hard and changed a lot of the car over to the new rules for 2001. 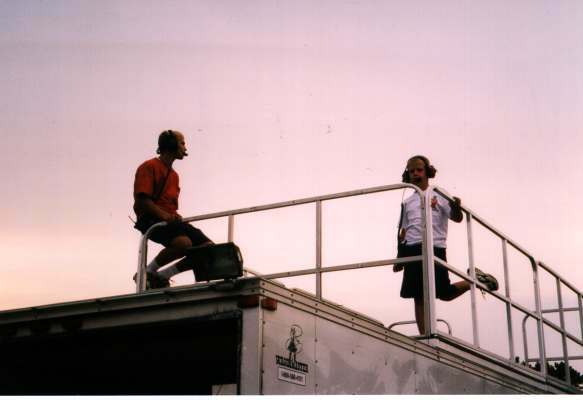 Of course we had to work hard at the track chasing the set up. I qualified bad which is a common theme for me and they kept working with the set up and we hit on one that worked. We had a good run up in the top 5 and blew a tire which had us settle for a 8th place finish. 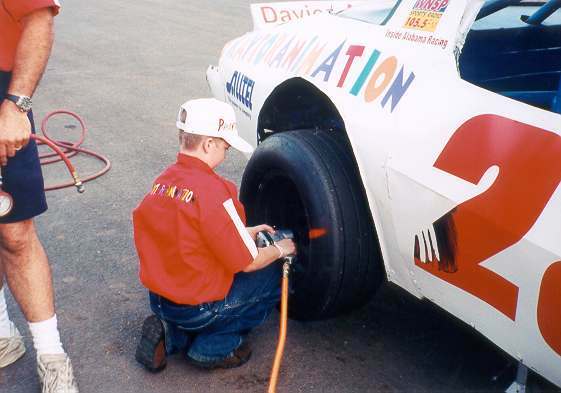 Thomas working on the car before the race. 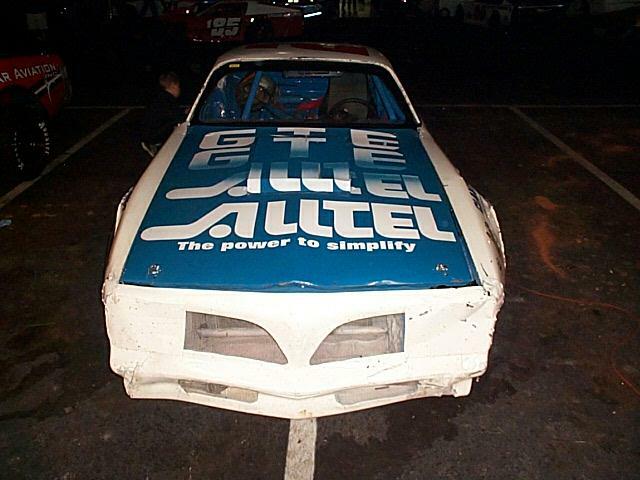 It was the first race for the new ALLTEL paint scheme. 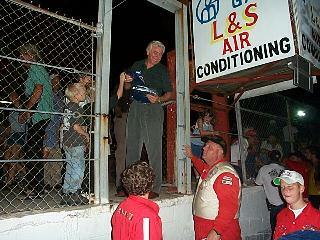 10-28-00 The night was a special event with a special Memorial Ceremony for former track promoter-owner Lee Fields. The races were special with it being double feature night. We raced one race inverted the field and raced again. 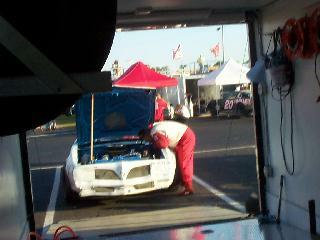 We unloaded a really good race car and then I started messing with and screwed it up for qualifying. 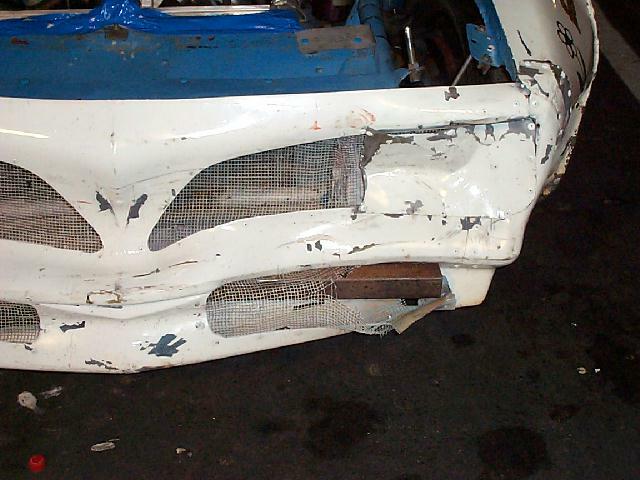 We got it back for the first feature and I got tangled up with another car trying to pass on the outside and spun the car out, which sent us to the back. 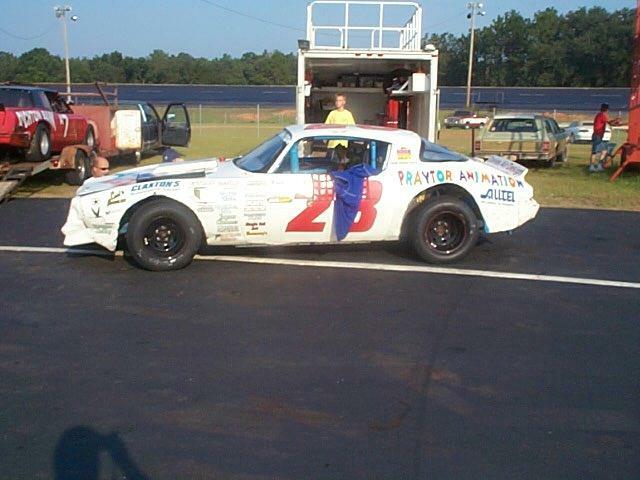 We improved a few spots but it was late in the race and we finished 13th or 14th. The good news was it gave us a good starting spot for the second feature and within a few laps we found ourselves running 2nd. 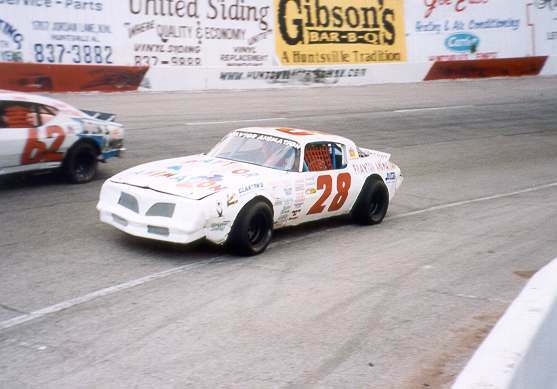 We ran 1 2 with Terry Britt, who ended up winning, until 4 to go and we got turned around by another car. We had to take up the tail end and got collected in a big wreck that started in front of us. We had some new help at the track. John Phelps was a great addition. 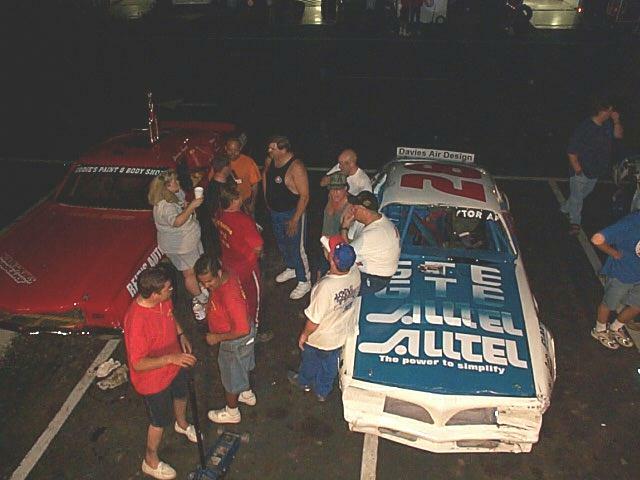 It was our first night with our new deal with ALLTEL for the remaining 2000 season. 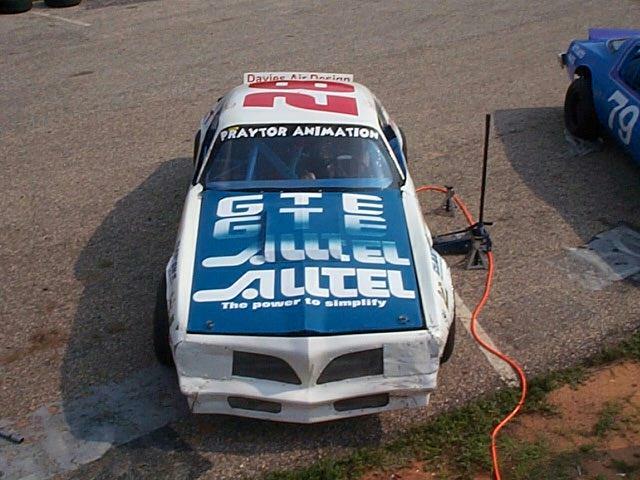 Although it was our first night with the new ALLTEL deal it was the last night for our familiar paint scheme. 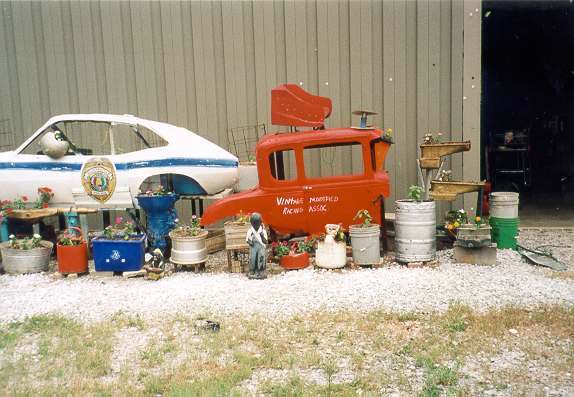 I got I little help getting it ready for the new scheme. 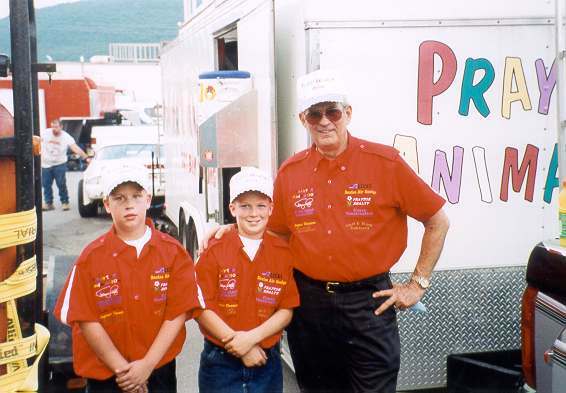 9-30-00 We showed up at the big 75 Lap Race with some lofty expectations after the last race. We made some changes to the car at the shop trying to make it even better. Unfortunately, after the second practice we realized I made the wrong call on the change. Ward and Thomas went back to work changing it back after we qualified and had a pretty good car back underneath us. My wife Julie and daughter Hayley made a rare trip to the track, we even talked Julie into scoring for me. Of course, I had an ulterior motive, the last time Julie came to the track we won but even all that couldn't help our sorry driver to the front this week. 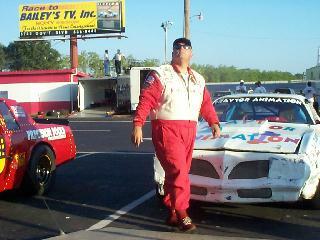 We started 16th and cruised along until a spin avoiding a wreck sent us to the back. We worked our way back to the front and I spun the car again getting us another trip to the back. Ward made some great calls spotting and we worked our way back into the top 10 with a 9th place finish. Ward made some great calls that kept us in it. My wife Julie & Daughter Hayley made a rare stop at the track. We even talked Julie into scoring for me. 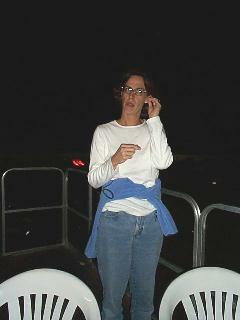 The ear plugs were to tune me out not the cars. 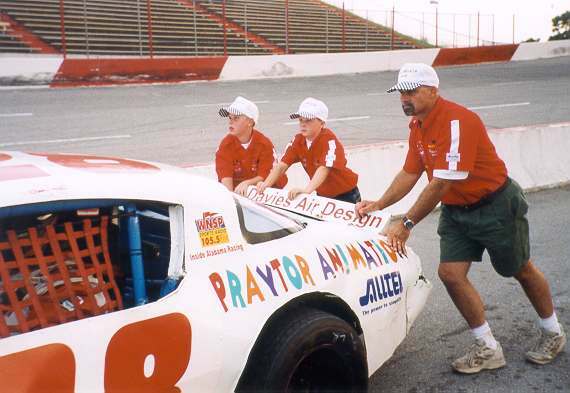 9-9-00 After being rained out last week and having made huge changes to the car we were ready to test out our new set up. Our car responded right off the bat and we knew we were headed in the right direction. We qualified 11th made more changes and worked our way up to 2nd in the heat race before the car slipped out from underneath me on the last lap and we lost a few spots. We made some more changes and the race started with a long green strecth and we worked our way up to 7th. 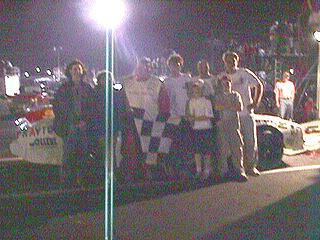 We had a short green flag stint to end the race and we finished 7th on the night. Our car has undergone some massive changes in the last couple races and we are close to having a really good car, if we could only find a driver we would have the total package. ALLTEL gave away 50 car sun shades and Commissioner Gary Tanner helped us hand them out. The new set up was so fast, it nearly blew the spoiler off the back. Ward & Thomas work on getting it put back on. 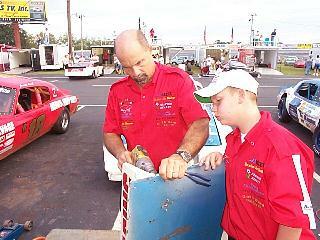 I'm getting a few pointers from the real racer, my son Thomas. Evan, Ward, Thomas & Cameron. this is rare photo because Cameron actually has his shirt tucked in. 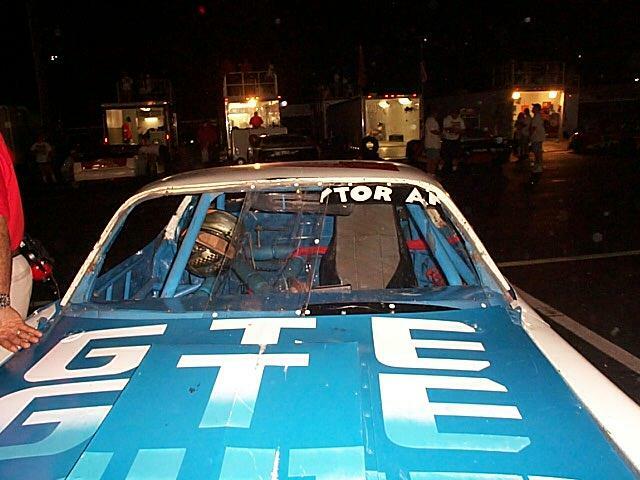 8-11-00 Friday night we rolled out the new GTE to ALLTEL hood and drew a great starting spot with a racey race car. I got hung out on the start lost a couple of spots and then started to work our way back up when the right front started to vibrate. 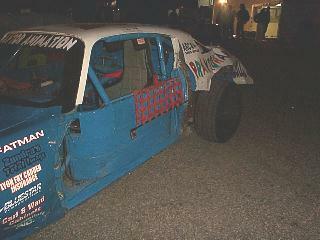 the longer we race the worse it got and made the car really hard to drive. We poked it around and limped home a 10th place finish. After the race we found we had burnt up the right front wheel bearing and I guess we were lucky not to be in a wall. that would only be the beginning of our weird lucky streak for the weekend. ALLTEL was our primary sponsor for the weekend and Derrick Purvis created this really cool hood with the fade/switch from GTE to ALLTEL. 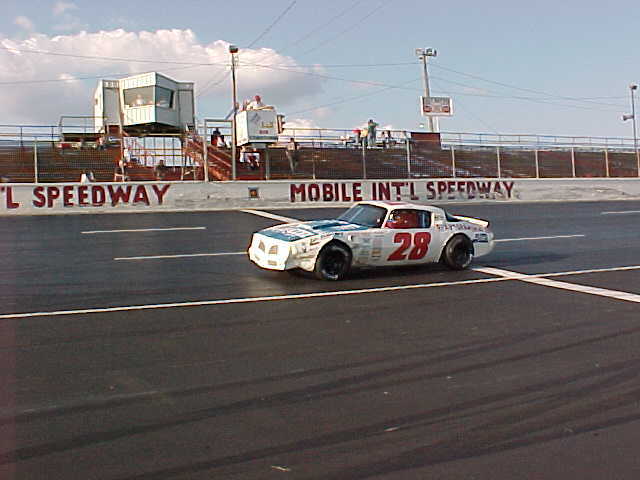 8-13-00 We fixed the right front and made major changes to the spring package in the car for Mobile. As usual I went too far with the changes and we were struggling. 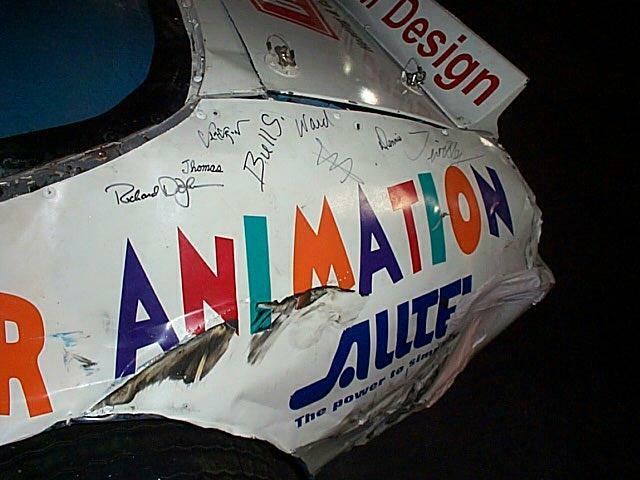 I missed the black fag race by spinning the car out in qualifying, "I ran out of talent before I ran out of courage". We made more changes to the car and started at the back of the heat race. We worked our way up to 3rd and then the fun started. After a caution the safety crew left some debris on the track. 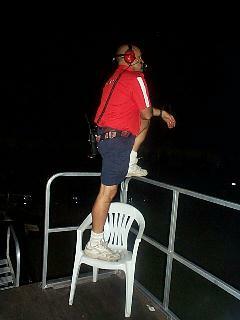 We sent one of our guys over to the safety truck to let them know and they didn't get it. We raced a couple of laps and sure enough the car in front of me ran over it and kicked it up in the air, it skipped off my hood, hit the edge of my roof then collapsed my windshield and hit me in the chest. It was then I found out the debris was a drive shaft out of one of the cars and it was now laying on my floorboard. I had another problem, the windshield was laying on top of my hands and the steering wheel and I couldn't steer. 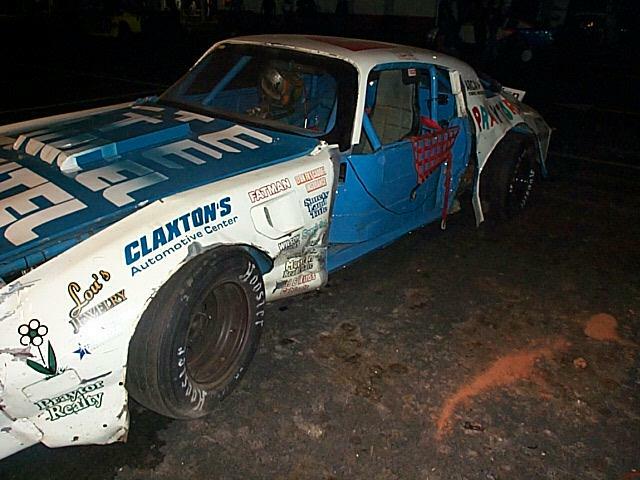 I pushed the windshield up with one hand and drove with the other, we finished 3rd. My guys went to work on fixing up some kind of windshield for the feature and it ended up looking like an IMCA Modified. We survived several cautions and then went airborne off of 1 coming down on the right front. I thought we were OK but when the race went green I had sparks and flames shooting out from under the hood on the right front. 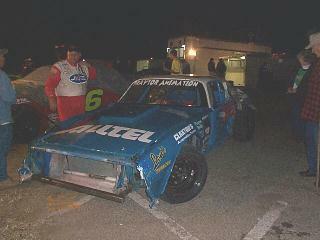 We brought it in with a broken right front brake rotor and we were done for the night. A weird night to say the least. 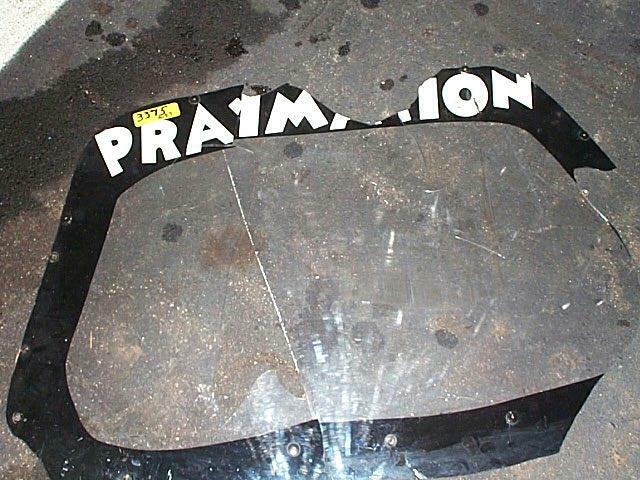 Whats left of the windsheild. 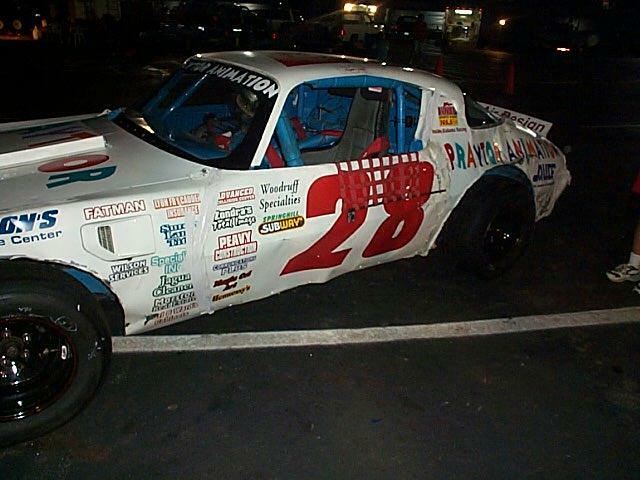 The guys fashoined up a partial windshield and we went racing. Jessie Reid won his first feature of the year and we had a major bull session going after the race with his crew and some fo the other drivers. 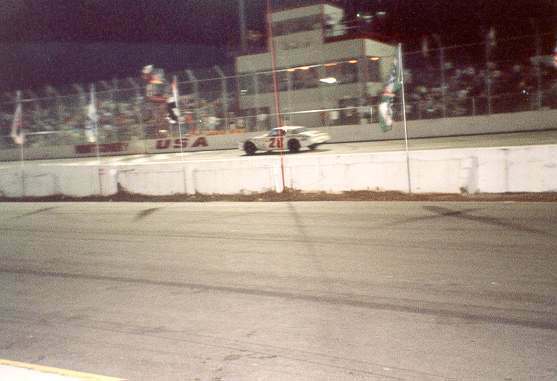 7-14-00 Friday night we were in Pensacola with a pretty good race car that ended up in the wall rearranging the back of the car. We finished the race but we were never a threat. 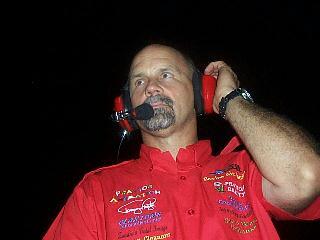 Congratulations to Mark Davis and his crew for picking up the win. 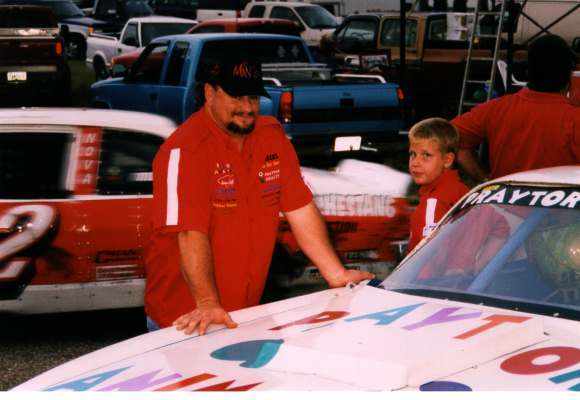 My crew chief for Pcola, Thomas and Mark Davis crew cheif, his son Stephen. Maybe when Thomas gets that old his driverwill learn how to drive. 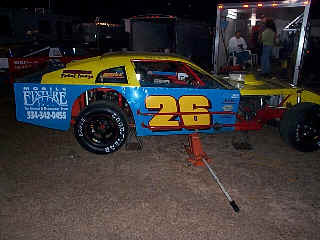 Thomas & Twilley before I started making chassis adjustments. 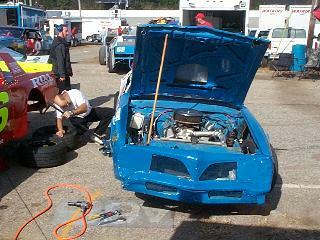 Twilley and Mike Woodson start the repair proccess by stripping the car down in Pensacola. 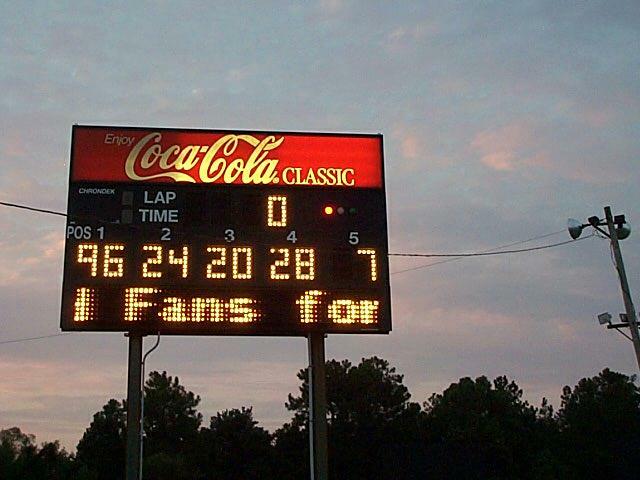 7-15-00 friday night in pensacola should have been an omen and we should have stayed home saturday night. Ward & Cameron Davis worked on the car all day Saturday and got us ready to race. Of course it didn't last long. Congratulations to Cale Gale on hhis third in a row. 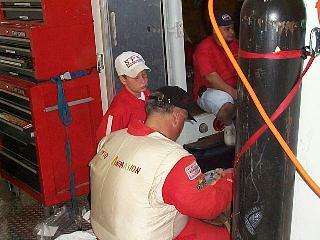 After a long night and longer day the guys had the car put back together and we were ready to race in Mobile. Steve Weaver tore the entire left side off the car and cut all electrical during the heat race. The guys went to work and put it back together again. 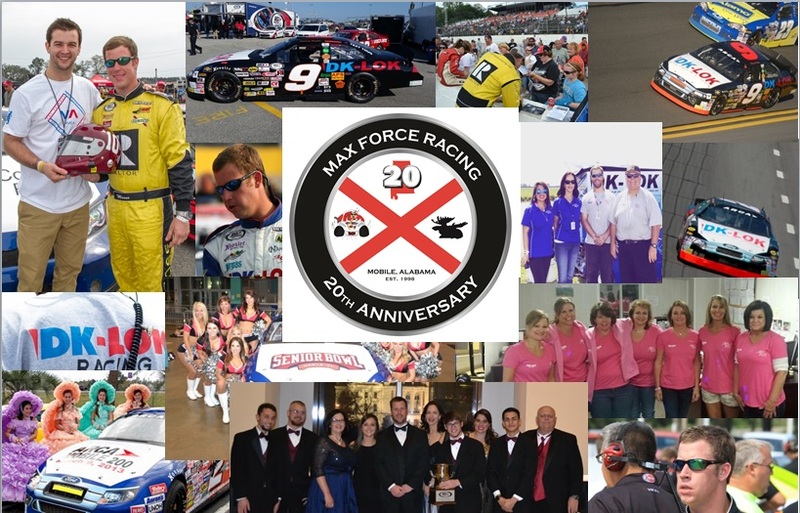 A special thanks to the Huntsville & Montgomery tracks and our road crew-Ward Davis, Anthony Claxton, Tom Claxton and Thomas Praytor. 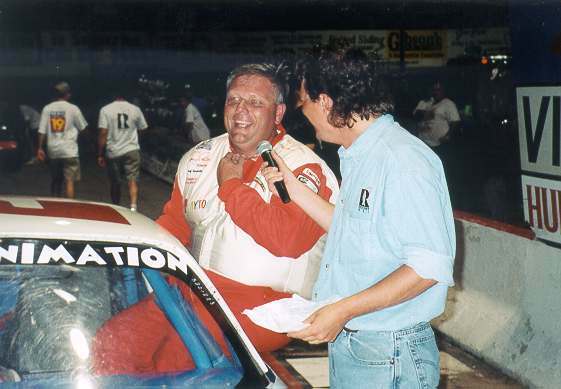 6-2-00 Friday Night, Huntsville-After a long haul up, we unloaded at a 1/4 mile bull ring with walls all around and after Mobile with no walls and a big half mile we had some major changes to make. 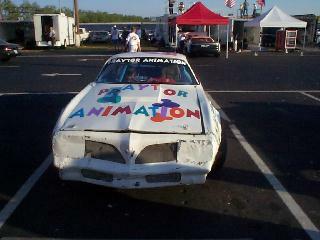 As is custom in Huntsville we only had 1 practice and then had to qualify, we weren't very good and started 12th. 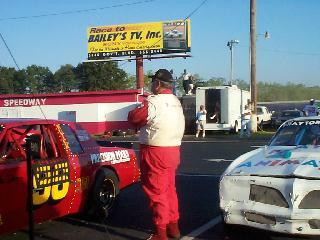 Before the street stock race we ran in the media race. The schedule was for 2 media races and then a finale but since we lapped the field in the first race we didn't run in the finale and got ready for the feature. Because the track was so much shorter than Mobile we decided to run the feature in 3rd gear which made the car work better and we were able to pass cars, dodge wrecks and moved up into 6th without putting a mark on the car (real unusual). 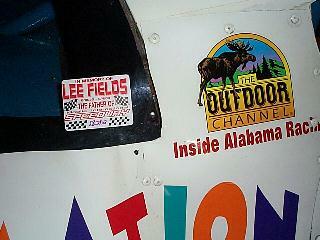 On the track in Huntsville. 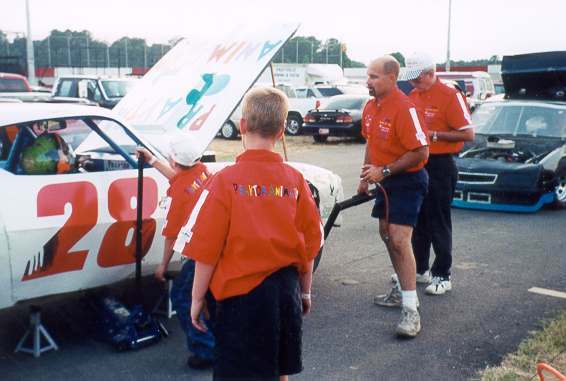 Ward and the boys pushing the car to qualifying. Post race interview after we won the media race. Thomas and I hanging out in Huntsville. 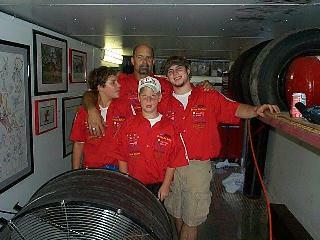 After we tore up antoher clutch we borrowed Bobby Varnon's shop. 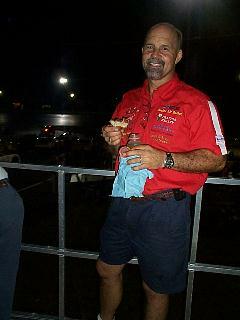 With over 30 years of racing he had everything we needed. 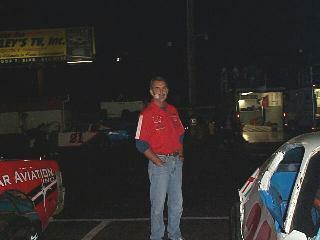 6-3-00 Saturday Night, Montgomery-While the car body was unmarked from Huntsville we did lose another clutch. 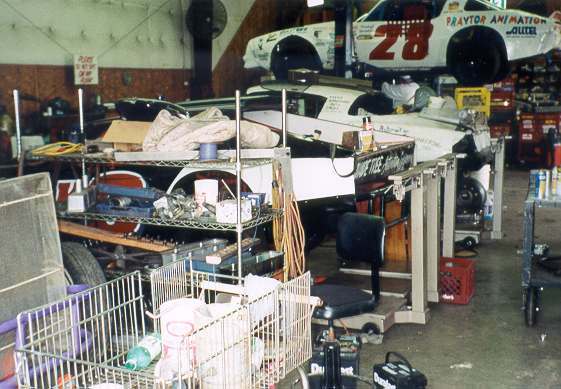 We borrowed another racers shop on Saturday morning and Ward and the guys put a new one in and we were ready to go, but we were late. We missed all the practice in Montgomery and had to qualify without ever having made a lap. We guessed at the set up and qualified 8th. After qualifying we noticed the water pump had problems and Tom & Ward replaced it and had me out in time to make the race. We ended up finishing fifth, but the changes we made after qualifying made the car worse and we were really just happy to have it all in one piece. On the track in Montgomery. We missed practice so we struggled all night. Anthony working on one of our many tire swaps. I go down and take right, right? 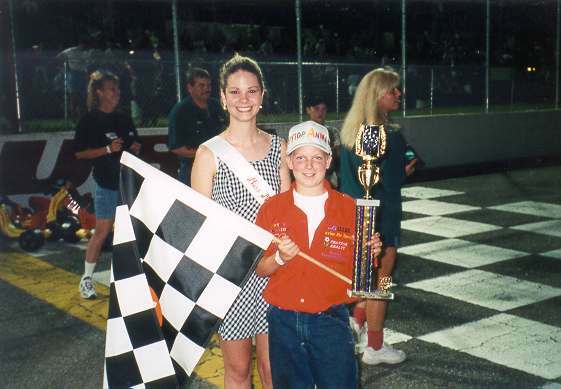 I couldn't find a win but somehow Anthony found his way to victory lane. 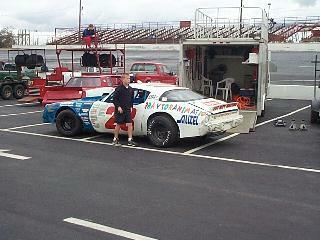 5-6-00, we struggled for speed our first 2 outings and finally found some. We improved our qualifying time by 5 tenths of a second from the previous outing and had a much improved race car. We qualified 13th and worked our way up to 5th before the clutch started to slip and we had to settle for a 7th place finish. We've been looking for some speed. I asked my son Thomas. I asked our engine builder, Tom Claxton. I even asked Mark Davis & Okie Mason. They all said it was me, so we closed it up and went racing. I probably should let a real driver like Anthony Claxton drive it. I think Thomas thinks it should be him. Uhhhh, the guy got lose in front of me, my foot slipped, well its not that bad! 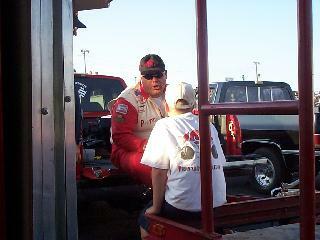 4-22-00, After taking 2 weeks off to race go carts with my son and Talladega we were back at the track. Opening week found us towards the bottom of the speed chart and this week wouldn't be much better. We qualified in the back and spent all night trying to get it back up front. We won the heat race and followed it up with winning the B feature. We took up the tail end of the A Feature and wound up with a 10th place finish. While we are racing good we are still not qualifying very well. We'll keep working to make it better. Hope to have some pictures up soon. 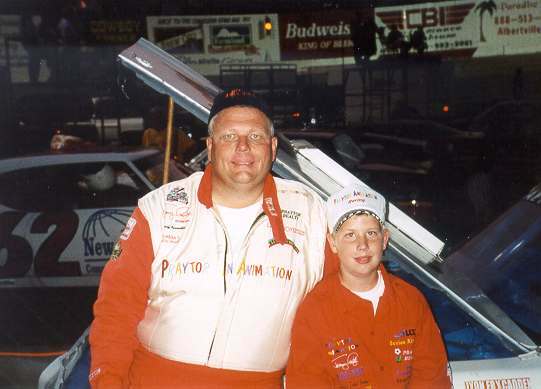 4-1-00, We took an extremely slow and out of practice race car and driver to the track opening night and some how snuck out a heat win. The lady at the far left is my wife Julie who made a rare appearance down in the pit area. Probably brought us some much needed luck.